I've taken our 2 kids out on our H16 when they were 5 & 6 yrs. old, and now I take the grandkids and their friends out on our H16. Don't tether them to you! It's best to take along another adult to keep an eye on the kid or kids. You skipper the boat; have someone else babysit. Keep the speed down and dress your daughter so that she is warm and fairly dry. Try to make it fun for her by letting her pull on the jib sheet or jib traveler. Sail faster than the monohulls and tell her it's a race. Life jackets, of course, for everyone. Have fun and please post pictures when you return. We've never vacationed on the Alabama Gulf Coast. Will do. A lot of times my wife will be with us. Bit thinking about the times that it just Izzy and myself. Might be worth practising man overboard drills in advance as well just in case someone goes over. Kids are very good at doing stupid things and the last thing you want if you have to turn about and pick someone up is to be rusty. Gary, I only bought it back in November. sxrracer - You're fairly new at this and Izzy is 6 yrs. old.??? 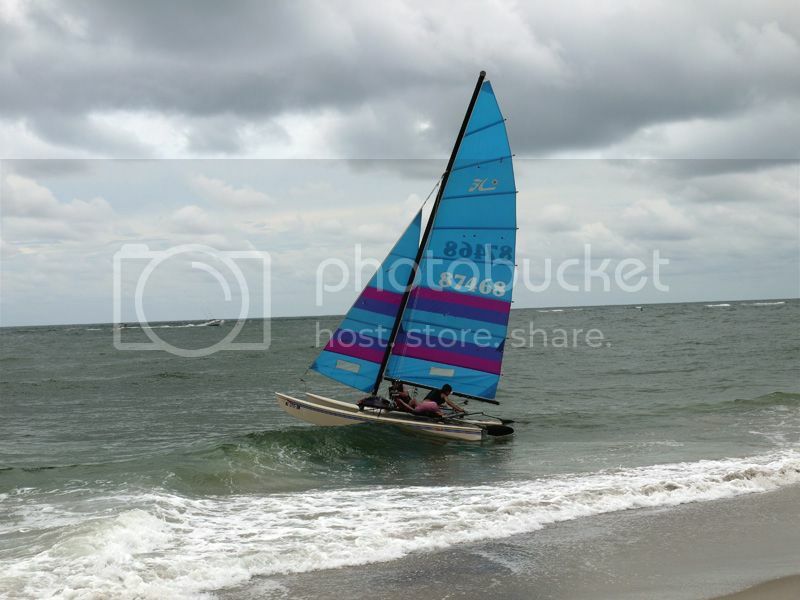 You don't routinely sail on the Alabama Gulf Coast???? I really think you should take your wife the first time out; maybe the first few times out. You skipper and she babysits. Kids are different. Some sit there and daydream; some fantacise and act things out. You need to concentrate on sailing and watching out for other boats, and not be distracted by an active 6 yr. old on a small trampoline. You also need to get familiar with your surroundings where you're sailing. It's ALWAYS IMPORTANT to sail within your comfort zone; no matter how experienced you are, where you sail, or who you sail with. Dip em by the ankle in a vat of sunscreen. so you can go out again the next day. Plan, have clear roles what to do if something happens and which parent does what - think thru some scenarios with your wife. Who watches who etc while x does y when z happens. Any crew would do this kinda planning but kids on board just add another consideration and in this situation give you the confidence to go out and have a good adventure. Kids and crew should know Hobie 16s can tip over and that's part of the fun, expecting it, talking about it, and knowing what do is a lot better than a rude surprise. Make it fun, let them participate: help rigging, let them 'steer', hold a sheet, stand watch by pointing out things like other boats out to you. Tell them to watch out for SpongeBob and dolphins for you. After all, you're also training your future crew ! Have a surprise, something fun and memorable, arranged at the end of the sails...ice cream (gives way to a beer when older) etc. Have alternative plans for fun if no wind or the kids need a change to pace. My kids have all been on my Hobie since they could hold on. My daughter is 6 and is my most avid sailing companion. My sons 9 and 11 are sailing the boat now. I never worry they will fall off, they have better balance then I do. They jump off often enough. I was thinking of getting them an Open Bic so they can solo. On the other hand we sailing warm water lakes, sailing on the ocean would be different I think, cold water, waves, currents and.... sharks . talk and practice!!! just introduced my kids to sailing. really talked up having fun and safety. we are are about to move on to how to... at first, the kiddos were terrified by the H16 with the younger one asking to slow down! now, they love it. Now 19, and a better sailor than I, our son first sailed at aged 15 months on a H16....and it was the only time he ever slept well! 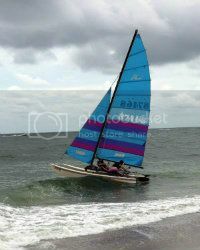 That's when I really learnt to sail... try holding a baby and a mainsheet and a tiller bar....and then doing a tack. Seriously, by about age 5 or 6, we would go out, typically one adult per child, and we would do things like "Captain Daddy throws the crew overboard", (of course, securely tied on with a 50' old jib sheet). Especially when it's hot and not so windy. When we went fast, he and mom would sit on the front cross bar and go water skiing with their feet, so what I think all of us are saying is "have fun, be safe, stay within your limits". If you are with children, be sensitive to their agenda, not so much yours. Nowadays, unless I am doing 150 mph and nearly pitchpoling, he tends to get bored. Or, we bring with three or four of his friends, in which case I become very quiet and let him yak away with how much he knows.....Bernoulli's theorem, CLR, CE, drag, and all that good stuff. Enjoy and have a great holiday. I like the vat of sunscreen comment. Here's a few more. First of all, learn to stop the boat quickly, heave to, and drift/sail backwards. It's often safer and faster that trying to do panicked figure 8's. Have a throw bag ready. You and the "crew" can practice with it on the beach. For the long term, teach them to respect the BOOM and not get tangled in lines.. Short term, keep them warm (rash guards and form fitting life vests, hats, wind breakers and surf sox). And watered/fed, w fruit and trail mix at least (I threw some M&Ms in my dry mix and kept a preschooler occupied all day). Plan your family trips around interesting sights or destinations, rather than your racing course. Games that focus on your environment are great (which way is the wind?, how's my-tell tales?, 20 questions, punch-buggy style games like spotting marine life, birds and other boats). Singing along the way is fantastic, and helps avoid boredom and seasickness. Oh yeah, avoid seasickness at all costs,.. and don't forget the camera! Last edited by NOHUHU on Wed Jun 05, 2013 2:22 pm, edited 2 times in total. Our kids are grown and gone now, but sailed when they were very small. Hobie used to make a PFD for kids that had a handle on the back of the neck float-may still do..haven't checked. They liked to lay on the front of the hulls. We didn't take them out in sporty conditions, but we all remember me grabbing one by that handle more than a few times, and lifting them back onto the boat-sometimes as they came out from under the rear crossbar.